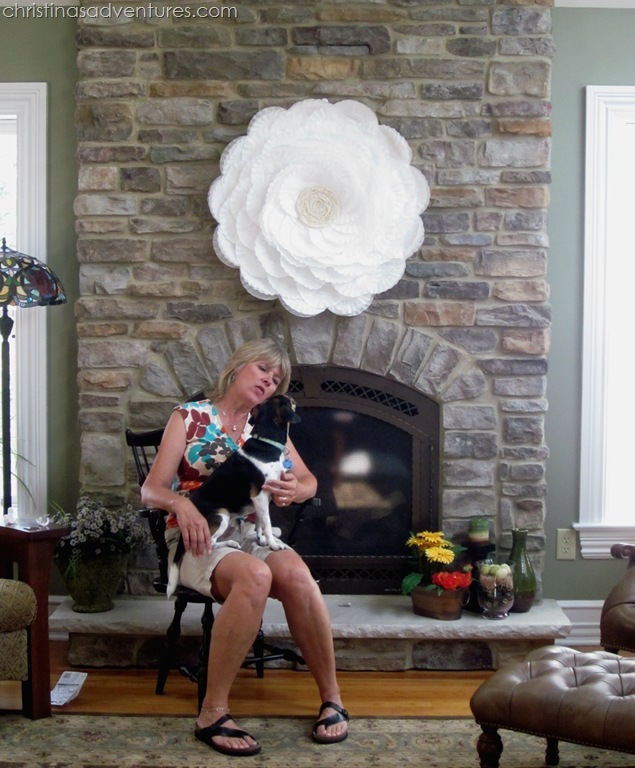 This coffee filter flower uses a hula hoop as a base – so it’s a BIG statement piece! Use for weddings, bridal showers, parties, or just for fun! This post contains affiliate links, full disclosure here.I am busy working on decorating for my brother’s fiancée’s bridal shower on Saturday, and I’m having so much fun! You’ll have to wait to see the rest of it (here’s the pictures of our shower!) but I couldn’t wait to share this project with you! I attached the coffee filters to the hula hoop with a low-temp hot glue gun (if you don’t have one, they’re super inexpensive on Amazon! ), overlapping each of them slightly. Now I needed to figure out something for the center. I didn’t want it to be another color, but I didn’t want pure white either. I decided to make a big rosette out of some lace from my husband’s grandmother. I just hot glued it right onto another coffee filter, and trimmed the edges once it was the size I wanted. I hung it with a command hook so we didn’t damage the surface we were hanging it from, centered it, and stepped back to enjoy the finished product! Don’t you love how it fills that space now?! It fit perfectly with the rest of our bridal shower decor! I love that this project is a big impact, but just cost about $6. Coffee filters are amazing! Oh my goodness. This is incredible. I want to make this for our dining room. YOU ARE AMAZING! That is one of the coolest projects I’ve seen for awhile!! I love it!! The huge size of it is just delightful! Job well done! 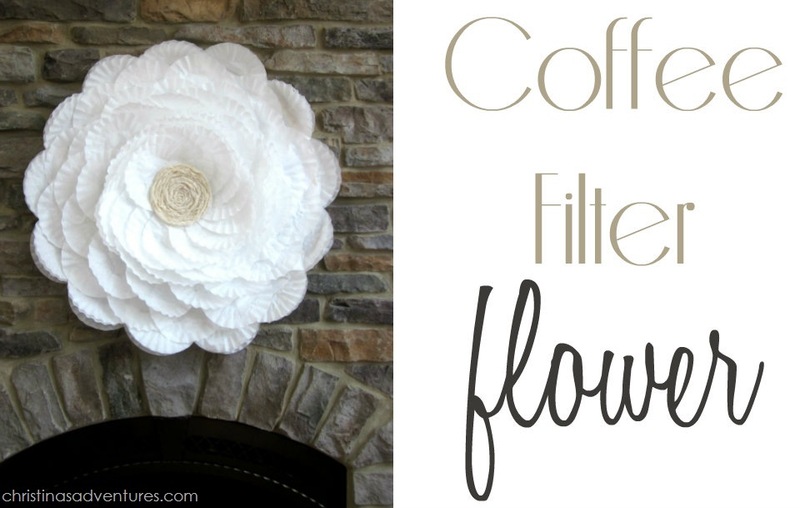 I absolutely love your coffee filter flower. Its gorgeous! It’s amazing!! You did such a great job! 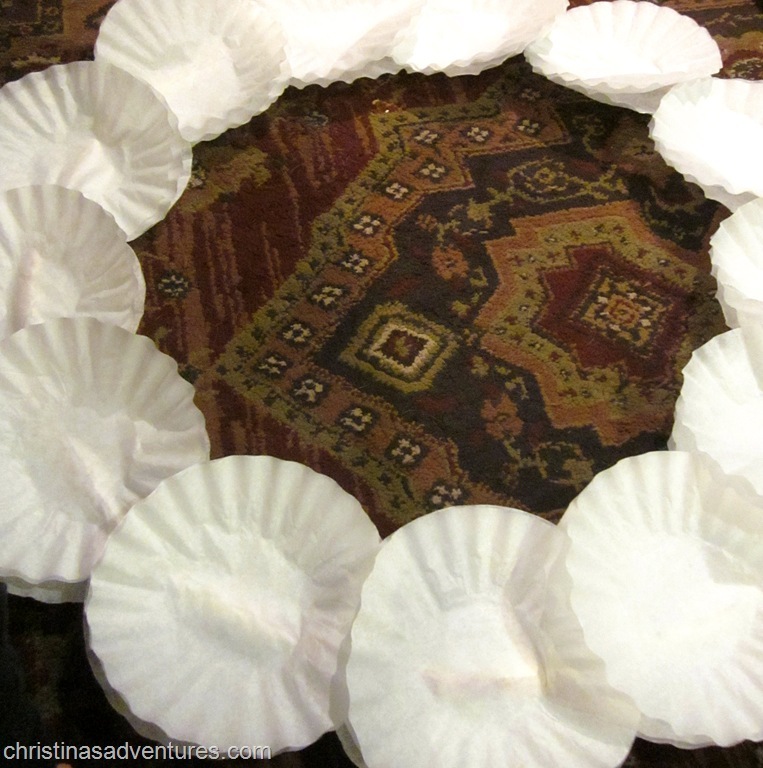 I bought coffee filters awhile ago but have yet to use them… Now I have a great idea! Thanks! Love this! I think I might have just found the inspiration I was needing to fill a huge decorating hole in my living room wall ! This is awesome! I love the simple statement it makes. Thanks for sharing! Your flower is crazy GOR.GEOUS! Seriously, you did such an awesome job, Christina! I would be thrilled if you would share it at my Feature Friday FREE-FOR-ALL party so I could feature you this upcoming week. um I am seriously impressed! this is beautiful!!! Can’t wait to see pics from the shower! Hope it goes well! This is amazing! I didn’t realize how big it was. You did such a beautiful job! What an amazing idea! And it has such an impact! I might have to do this for my office, but I think I would die the filters first for an awesome pop of color. Love it!! So amazing what can be created with simple kitchen items. Great job! This is absolutely gorgeous, i’ve not seen flowers this big before. What a great idea! So Creative, thanks for sharing! 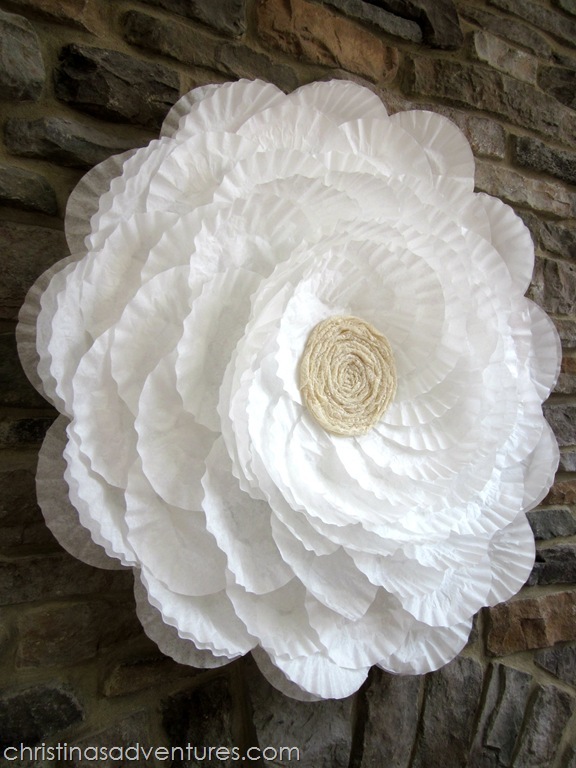 This paper flower looks great! We’d love to feature it as a how-to on CraftFoxes. Interested? Feel free to email me at bethany@craftfoxes.com. Thanks for linking up at Someday Crafts. I will be featuring your project tonight on our blog. Thanks for the inspiration! Ah Christina, I am speechless, this is FABULOUS! This is FABULOUS!! I MUST make one – I’ll think of somewhere to put it. I think I’m seeing it in my Christmas decor. Thanks for sharing! Uh…. LOVE!!! It is gorgeous! It is so perfect on the fireplace! Thanks for linking up to this week’s Catch a Glimpse Party! I’ll be featuring this tomorrow! I did not realize it was so big till I saw the hoop and the final picture. This is stunning! 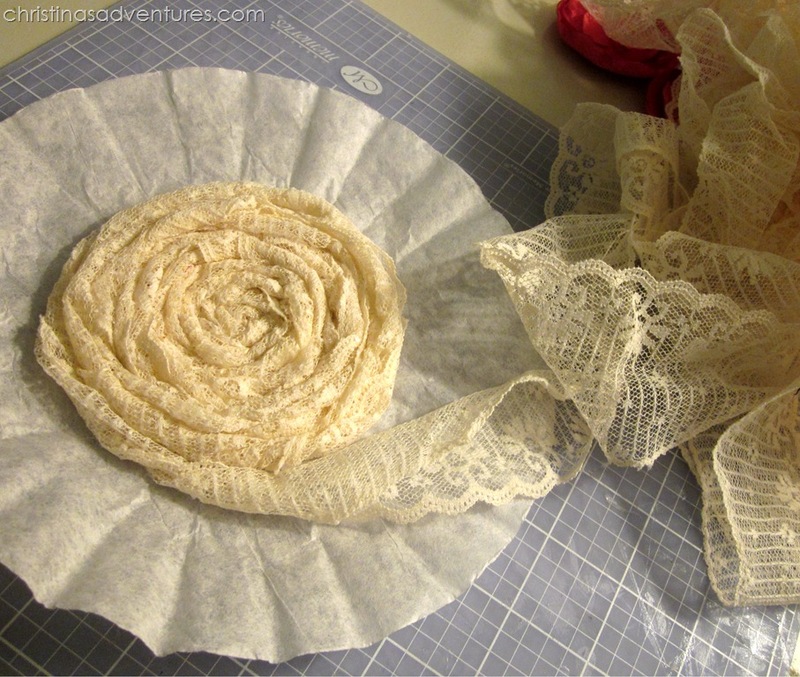 Love the lace rosette in center… perfect touch. This is seriously gorgeous – my daughter is getting married next summer – I want tons and tons of these everywhere!!! Definitely your newest follower – would love to have you visit and follow back! I followed your tutorial and made the wreath for my front door! Love it! Thanks for such a cute idea! This is so awesome! I love that you made something so pretty for so cheap. I will definitely keep this idea in mind for the next girly party/shower I host! Thanks for sharing the inspiration. Pinning it! I know this had to be the talk of the Shower. I think the flower itself is a great present…they could use it over thier bed…for the honey moon period anyway. 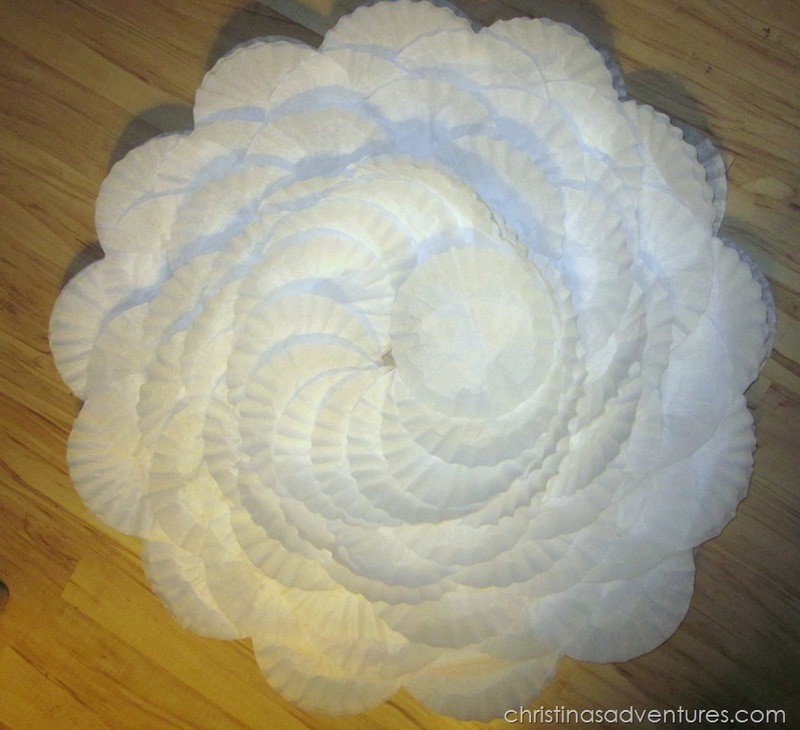 Christina, I just came across your coffee filter flower! And I absolutely love it! I’m going to give it a try. Thanks. Gracias Cristina. Me encantó la idea. Te prometo hacer la rosa pronto. I love love love this! Thank you for sharing and I am going to give it a try but I have one question that I hope you or someone else that has made one, can answer for me. The first row of filters on the hoop..are they stacks of 4 or (?) and are all the others after the first row just (1) individual filter?? Please HELP so I can get started and thank you again!!! I bet you could make smaller versions for the table, packages, etc out of muffin liners. This is just lovely. Love it! This flower is beautiful! I am going to add this to my project list. You did such a great job. First time reader here (came over from East Coast Creative) – this is great!! You did a fantastic job. 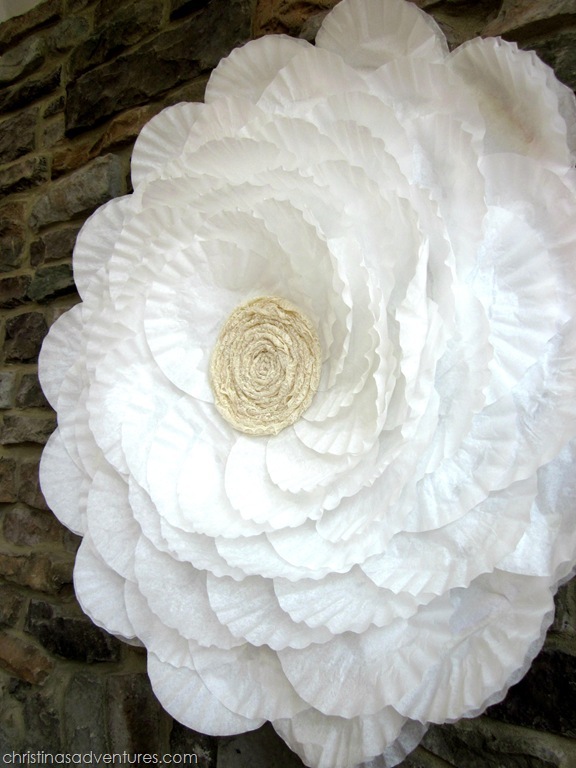 It’s amazing what you can do with coffee filters!! About how many coffee filters did you use? This is just beautiful. I am going to try and make this for my sister’s upcoming bridal shower, and maybe even take it home to hang in my house afterwards! What a wonderful idea! Thanks so much for this! I am going to make this for a women’s conference. CUUUUUUTE!!!!! Wow, this is simply gorgeous! It looks so elegant and yet so easy to do. I will be pinning this one for sure. Thanks for the post! Keep up the great DIY work! You have inspired me to make this for an upcoming bridal shower I am hostessing! 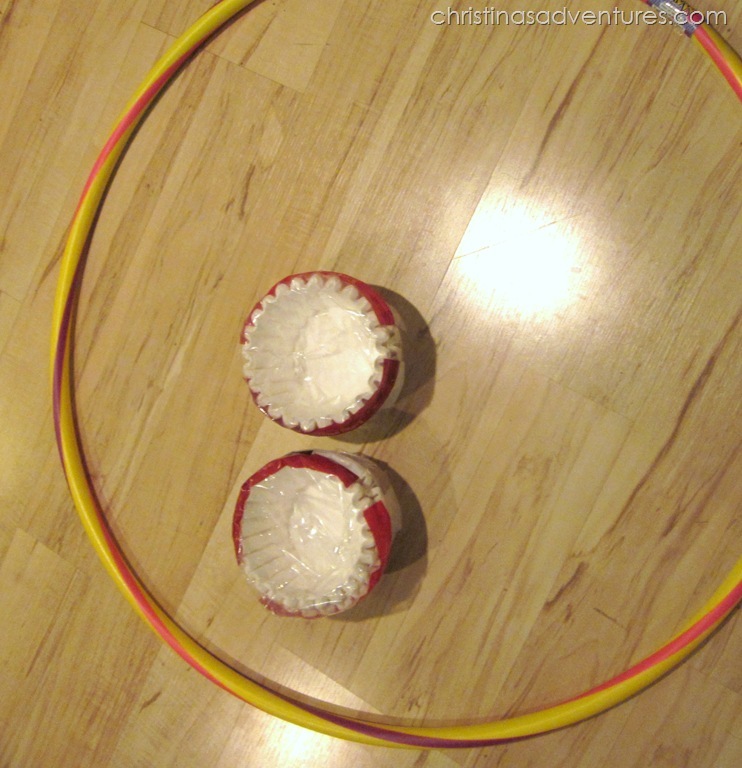 Quick question for you…when you start your first row attached to the hula hoop…are there multiple coffee filters on top of each other…where you would put one…are there several on top of each other? I just finished this for my sister’s upcoming bridal shower in August, turned out beautiful. 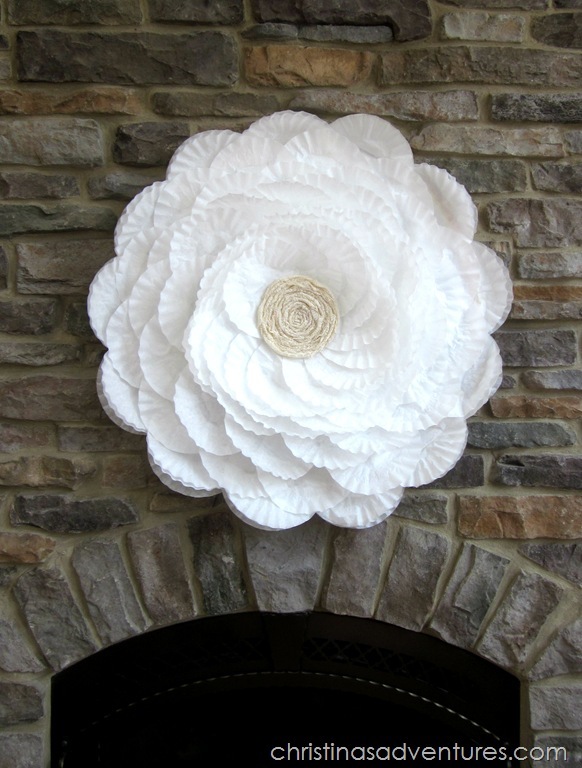 For the table centerpieces I made coffee filter peonies and this was a great addition to my fireplace also. Thanks for the idea!! thursday i’ll post this lovely flower on my blog. Thanks for sharing this. My friends in the Netherlands will like this. Absolutely gorgeous! Can not wait to try this out for my Alice in Wonderland themed party! 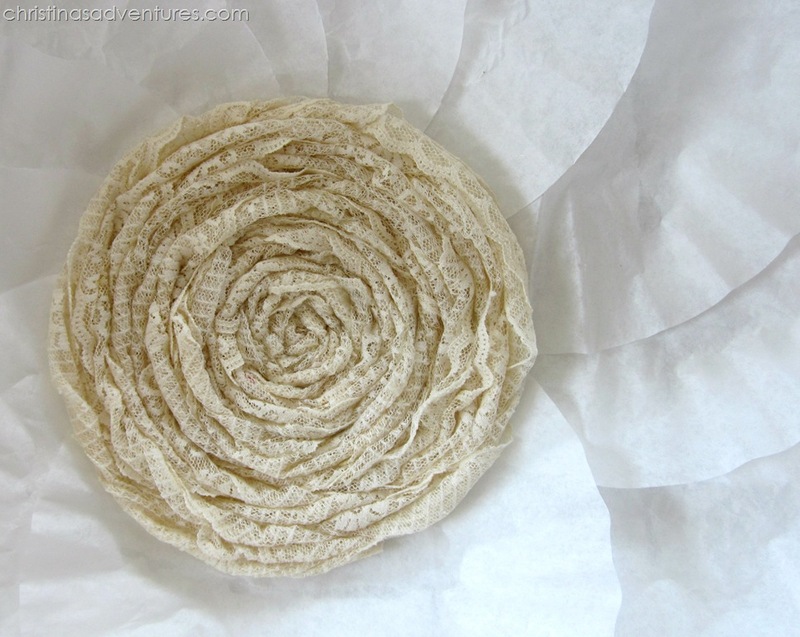 I love the coffee filter flower and want to make it for our Easter Brunch. What I was wondering is if you could give me an exact count of how many filters you used for the whole project and how many you stacked together per ‘petal’? I am really looking forward to working on it this next weekend. Amazing, I am new at crafting and this inspire me. Absolutely amazing! I’m making one right now. Did you put 2 coffee filters together or just a single layer?